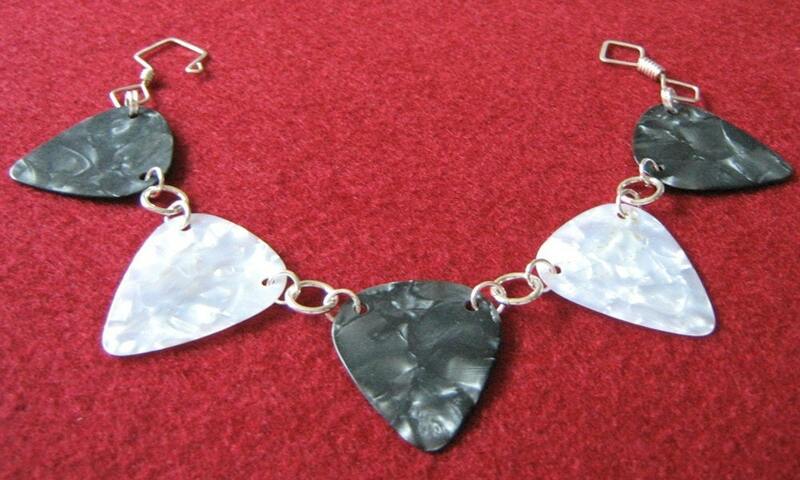 Handcrafted Artisan Jewelry in Stone and Sterling… That’s Headley! The That’s Headley! shop is a fun little corner of Etsy! Her creations have a simple elegance and there’s something that just seems… happy… about them. 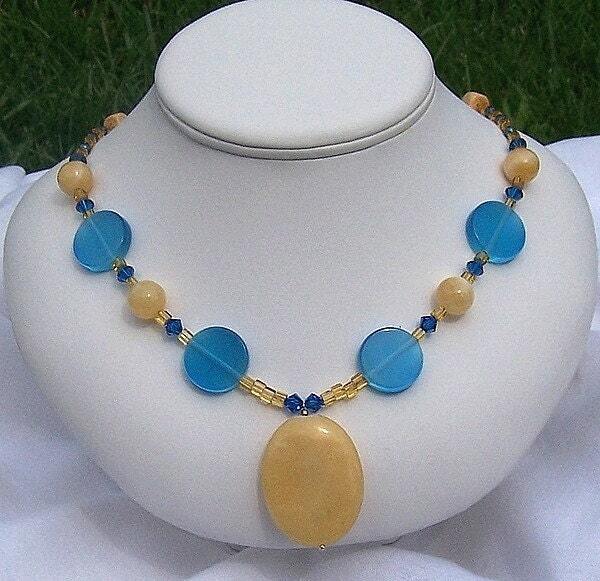 How could you be anything besides happy when wearing this stone rainbow necklace?! I think it sums up the feel of Headley’s shop really well so I had to show you that piece. I usually only add one picture to the feature, but I just couldn’t pass up this one. It’s beautiful and the picture is wonderful too! You MUST go buy this right now, find the perfect outfit to showcase this amazing piece, have a remarkable evening wearing it, take pictures and comment on this post with a link so we can all applaud you for your impeccable style! 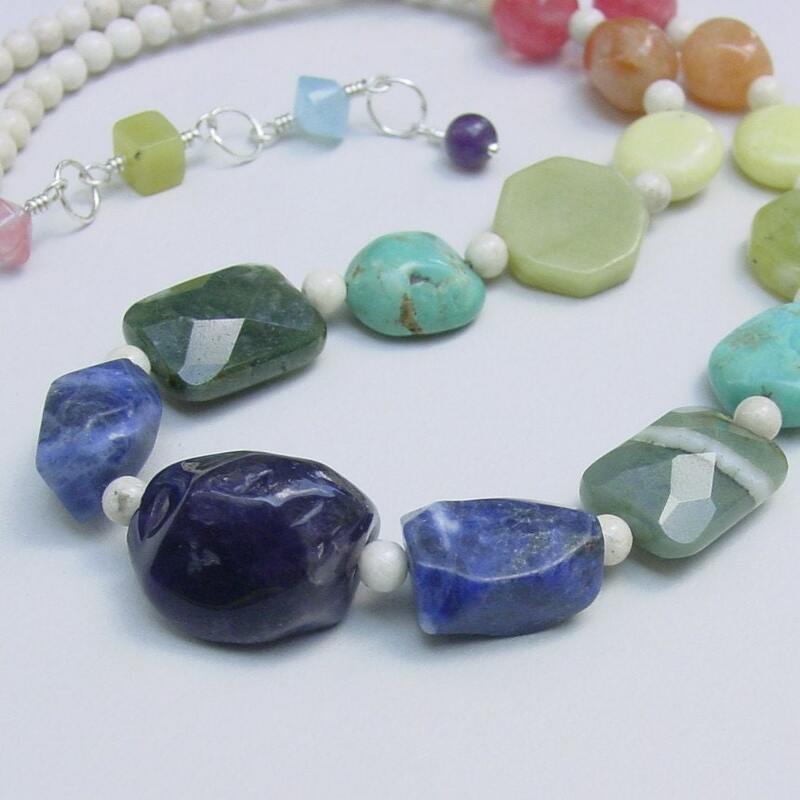 As vast as her style, is the materials she works with which include semi-precious Gemstones, Pearls, Swarovski crystals, Wood, Shells, Sterling Silver, and a recent addition: silk and braided cord for Chinese knotting. She also loves to discover vintage jewelry to use in her creations. Take a look at this and her other beaded jewelry here. 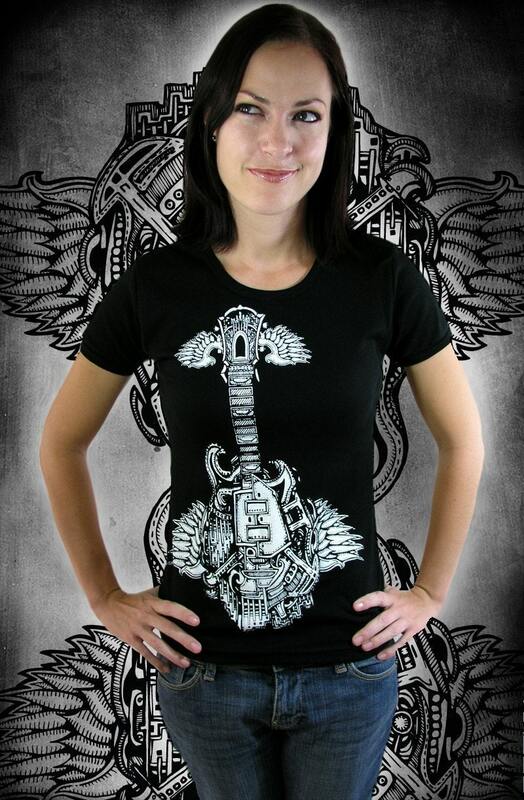 All things guitar related have a special place in my heart. Some of my fondest childhood memories are of my Dad strumming his guitar and singing songs I would later learn were by greats like James Taylor & Neil Diamond. I heard my Dad sing them first though, and prefer his version over some of the originals. Although Guitar Hero for PS2 is the closest I’ve come to playing myself, one of my brothers has played for years now too and listening to him and my Dad play their guitars when my family gets together is always a special treat. So I definitely had to choose the piece below from the Elements by Dawn Etsy shop for this feature. This fun and lightweight bracelet is comprised of alternating white and dark grey genuine Fender® Celluloid guitar picks and Sterling Silver. This and other of Dawn’s pieces reflect her interest in pattern and texture. Her designs take on movement and tactile interest. Her fondness of circles, spheres, disks, and symmetry is expressed throughout her designs. Brought up in the vivid sights and sounds of Manhattan's art community, Syl of Bagitup4me has always been mesmerized by small pieces of everyday life which most people don't realize have the potential for becoming wearable art. Her creations incorporate elements from bygone eras into original designs. Using a collection of vintage buttons, rich fabric and other findings from various parts of the world, she explores the use of shapes and colors to capture an era or evoke an emotion. There has been a gradual and natural evolution to her work, from hand-painted leather belts to three dimensional mosaics to tapestry bags. When designing tapestry bags, she enjoys working with shapes: simple rectangular shapes rich in color and texture and adorned with vintage pieces. The colors she selects: mustard, black, red, orange and olive green, among others, are reminiscent of the 1920's and 1930's. The Kala shop on Etsy hosts a collection of crafts that are true to its creator’s admission that she has “trouble deciding what to do”. Karen is a professional artist residing in the UK. She has unique pieces of beadwork, mixed media collage, paper arts, and even does custom pencil drawings. Since I’m in the tree trimming spirit (it’s beginning to look a lot like Christmas in our home) I picked this hand beaded garland to show you. 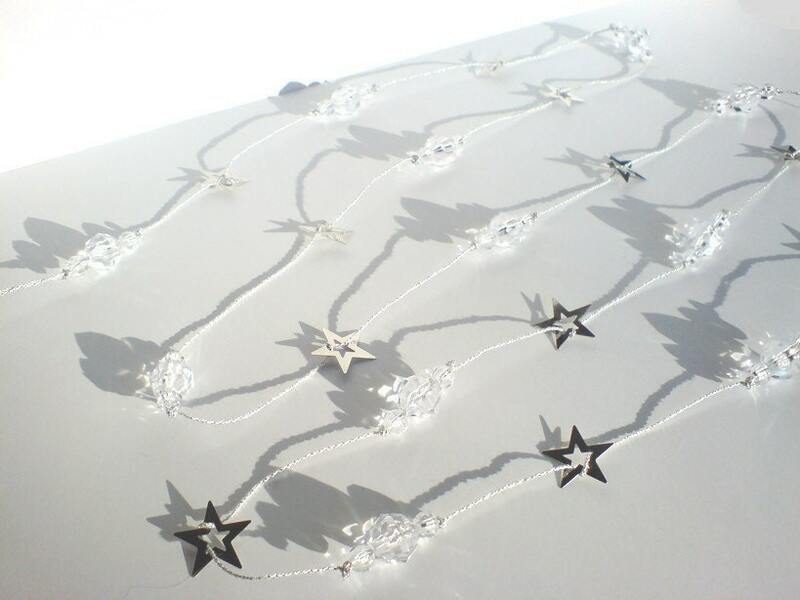 The beads themselves are pretty on their own, but the metal star accents give it a special detail. It’s sophisticated and a bit whimsical at the same time. It would be perfect on a tree, in a garland, or wrapped around a wreath. Take a closer look by clicking on the picture above and visit Kala’s shop to see all her other handmade wares. Visit Staci Rose Designs on Etsy for original, hand-made, and one of a kind: Original Oil Paintings, Handmade Jewelry, Decorated Picture Frames and Mirrors, Judaica, and more great gift ideas! Here is an example of birthstone earrings that can be custom-designed for yourself or the woman you love! 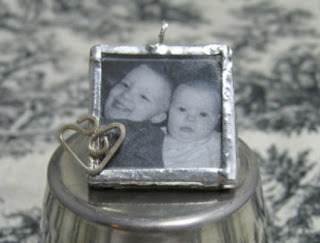 These make wonderful and meaningful gifts for Mother's Day, Grandmother's Day or an Anniversary. Each earring will represent two to six months of your choice, have between two to six beads, and all earrings will be one-of-a-kind! Staci is an artist living and expanding her creativity for the past 10 years in the San Francisco Bay Area. She believes, "that every specially crafted piece I create is intended for special individuals." 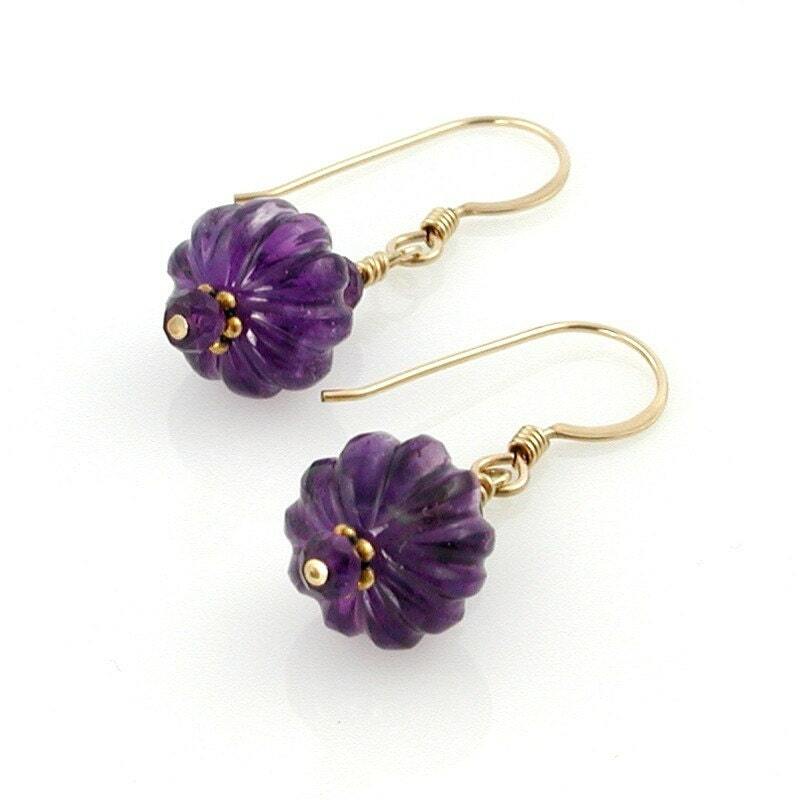 Moda Design's is a self-taught bead jewellery artist. She deals mostly with stones and shells. She prefers undyed items to work with and seek out only the best supplies & suppliers. Everything in her shop is lead and nickel free! She lives in a small town right on the US-Canada Border with Washington State. 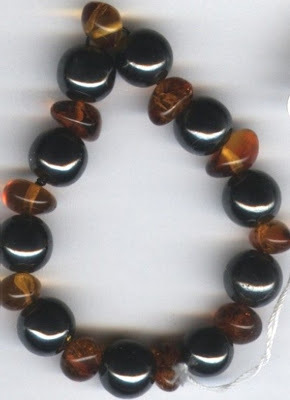 The piece abovis is a dark amber and healing magnet arthritis relief bracelet. It is made from HUGE Magnets that will bring arthritis relief while warm polished rootbeer amber will bring compliments! 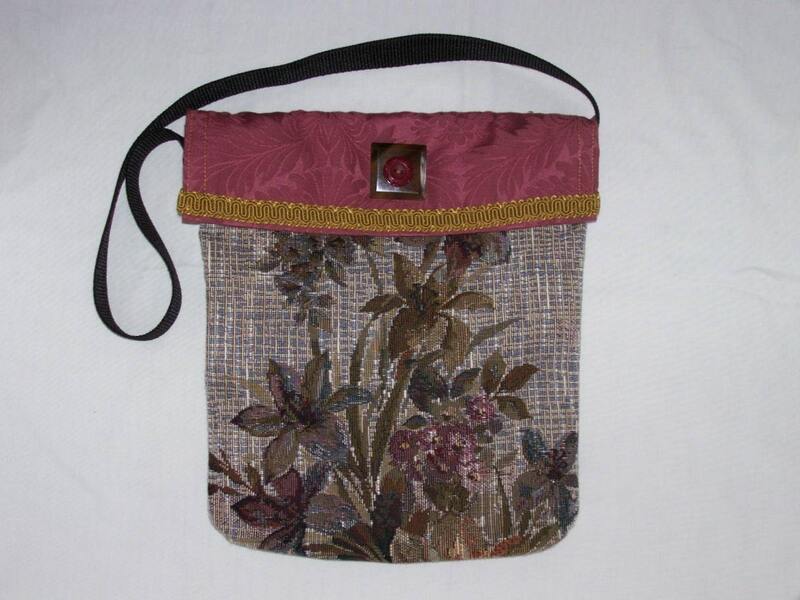 You can visit Moda Designs at http://www.modadesigns.etsy.com/. The bags featured at http://jajaja.etsy.com each tell their own story. Not often have I considered where the materials that my bag was made of came from, but each of these unique creations not only make you think, they come with an explanation of where they've been. This is a new spin on the concept of going "green". Personally, I like bags in a all shapes & sizes so it was fun to see no 2 bags looking exactly alike. Whether it's warm outside or cold (like where I live) these fascinating little bags could give you that warm fuzzy feeling - like they have their own heritage. Toni lives in Alaska where it gets VERY cold in the winter...-50 degrees F Toni is most famous for being "Mommy" to my 15 month of twin daughters! They are her inspiration for KuddleBugz Threadz! With the need in Fairbanks for warm baby items, she felt a tug at her heart to use her talents to help other mom's! Her daughters were also the inspiration for the shop name! "They are truly my little kuddlebugz!" Keep your little ones warm and cozy this winter with a beautiful Infant Car Seat Cover! For those tiny toes pick up a pair of warm and cozy booties! Don't have a NEW Baby? How about new hat or pair of mittens for that Toddler in your life? Looking for something special? Toni is happy to do custom orders! You can visit Toni's shop at http://KuddleBugzThreadz.etsy.com. Today's featured shop, alilsumptinsumptin, offers original, handmade bracelets, necklaces and earrings. Etsy artist, Eva, creates one-of-a-kind pieces that often incorporate two of her favorite things: flower gardens and dogs. She finds that, "Whimsy brings me great joy and touches that little girl within me. Most of my creations reflect this aesthetic..." Self-described as a "Jill of all trades, master of none," she has been involved in some form of art since childhood; receiving formal training as a Fashion Designer, Illustrator and Calligrapher. Eva has been designing jewelry for about 3 years. Especially admirable, this Etsy artist even uses her talent to give something back to a favorite cause. In honor of her two golden retrievers, she started PAWS FOR A GOOD CAUSE so the sale of her jewelry and accessories could benefit charitable organizations like the Humane Society of the United States (HSUS). Below are some of the pieces which 100% of the sale proceeds are donated. 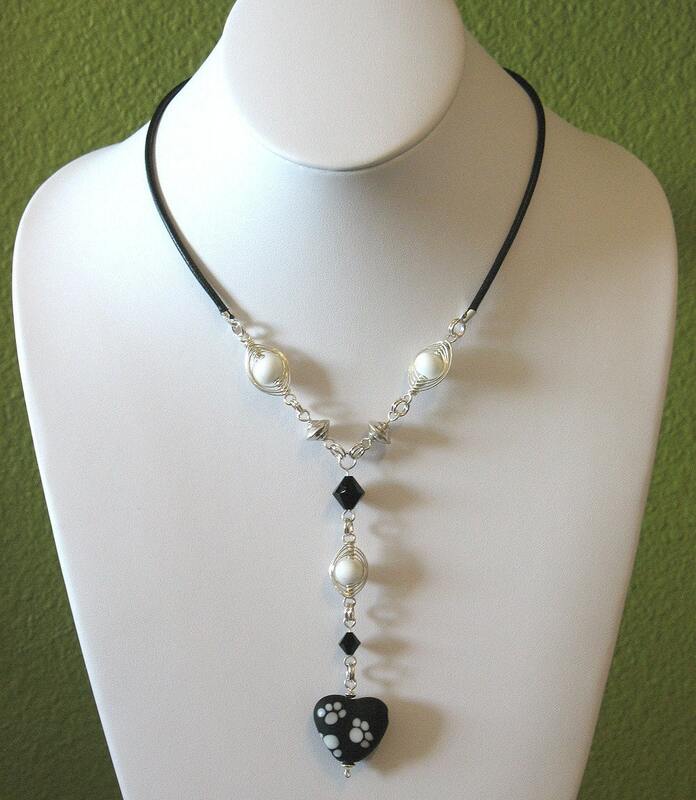 NITTI GRAFFITI - This leather choker features an edgy black and white "graffiti" bone torched by favorite glass artist, Janet Crosby. Each side is decorated differently with random swirly scribbles, giving it a spontaneous and energetic vibe. 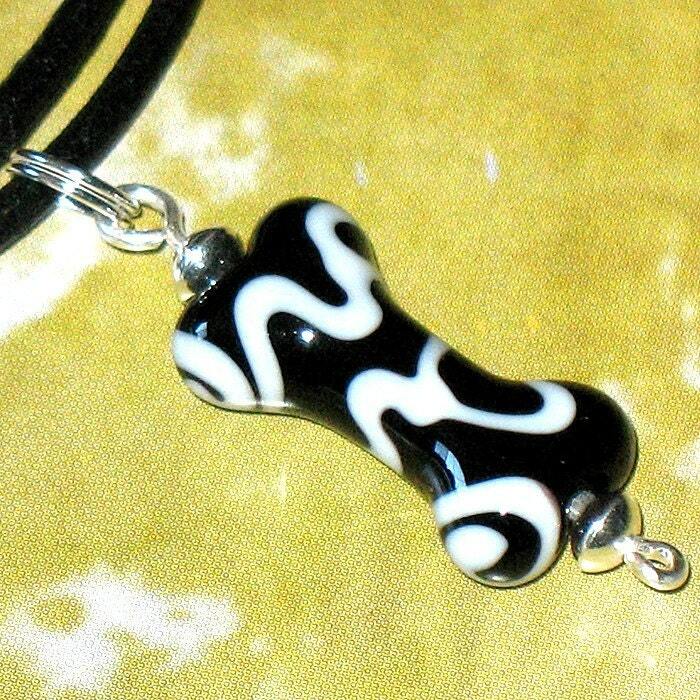 AMORES PERROS - This Y style necklace features a lovely heart bead by favorite Lampwork Glass Artist, Janet Crosby. The heart is made of opaque black glass with white paw prints and is etched for a matte finish and a soft velvety feel. Be sure to check out all of the wonderful, unique pieces at this shop - there's alilsumptinsumptin for everyone! 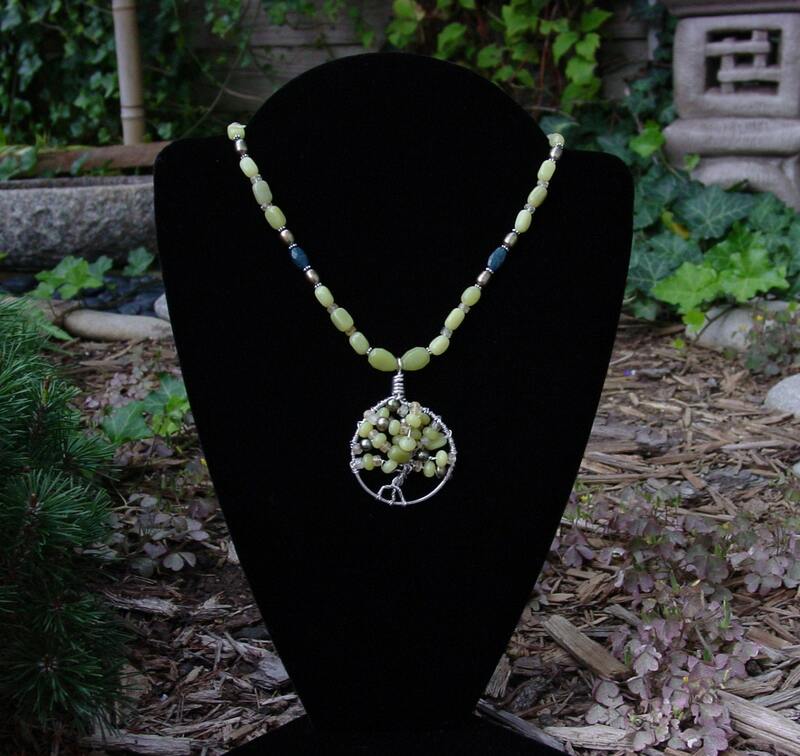 Hi, I’m Phyllis Mufson, a jewelry artisan and a creative career and small business coach. I started making jewelry while directing the Locks Career Center at Moore College of Art & Design, an inspiring environment where I worked with wonderfully creative people. Now I work in my sunny living room where I talk with clients and have all of my jewelry equipment close at hand. My design inspiration is my 23-story “bead condo” – clear, stacking sectioned boxes brimming with color-coordinated gold and silver, gemstones and pearls.Earlier in my life I was a textile artist and that sensibility influences my designs. I'm concerned with how the jewelry drapes and moves with the body. I'm also inspired by my customers. In addition to my ETSY stores I sell through private jewelry shows so I get to see how women respond to the jewelry. I talk with them about what interests them, and find out which designs are particularly flattering to wear.If you like Personal Treasures but are looking for something more simple or casual please visit my Mufi Jewels store at http://mufi.etsy.com.You can learn more about my coaching practice at http://phyllismufson.interfaceias.com I also have a blog where I write about creativity and creative people – http://personaltreasures.blogspot.com. Today's featured Etsy artist is a wife and mom to two teenage daughters. She and her daughters enjoyed learning to bead together. Over the years her daughters have moved on to other crafts, but she continues to develope her designs into more intricate, complex, works of art that are usually crafted with small beads. This artist's skill and creativity is apparent in this wave design beaded tealight holder. It's created using over 4,000 Japanese Delica beads in three shades of green, one set with an aurora borealis wash. It's big enough to hold a votive candle, but just imagine how beautiful the twinkling light of a tea light set low in the holder would be. This would make a unique gift that's sure to please anyone on your list. Check out A Rose by Name's Etsy shop for lots of amazing bead work from jewelry to business card cases. Silver Dragon has always been an artist and one of her earliest art memories is also one of the influences that has stayed with her from the very start. She was four years old and her nursery class had a field trip to a local museum in Rochester NY. She was completely mesmerized by the textiles and beadwork of the native Americans. She doesn't know how long she stood there just gazing at the work and absorbing all that the creator had to say. Her path as an artist, however, was a duet of both fine and performing arts. She is a (retired) ballerina as well as a published artist, having done illustrations for a CD picture book, "Papa Cardinal Finds Breakfast" by Sandra Wellborn. One of her paintings accompanied and essay she wrote for an Astronomy textbook. She also holds a Masters Degree in Astrophysics from Rensselaer Polytechnic Institute in Troy NY and has worked as an astronomer and still teaches astronomy as an adjunct professor for University of Maryland University College. Her work has continued to grow and expand and she now also count herself as a mistress of the art of beadweaving. All of her work is one of a kind (with occasional limited editions -- She has a hard time doing things more than once!). 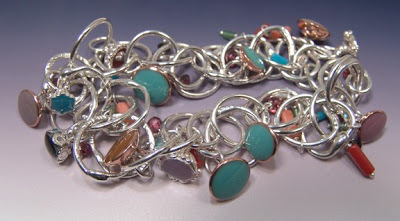 She likes to play with color and texture, experiment with shape and drape and form. Please check out Silver Dragon's shop at http://SilverDragon.etsy.com. 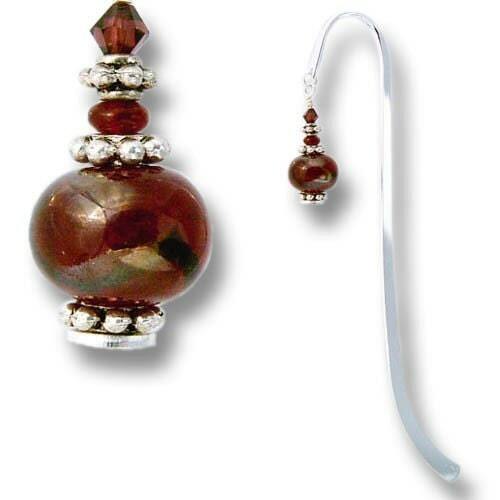 Anne Dundas beads are each a treasure for the eye as can be seen on http://annedundas.etsy.com. Living in Australia, caring for her mom, Anne seems to have found her niche in each of her unique bits of art. Her shop carries all types of uses for her beads. My favorites are her bookmarks. I'm an avid reader and there's just something special about setting down a book with a beautiful bookmark saving your place until you get back. Michael Gresh is a man of many trades. Designer of hotels by day, craft inventor and schemer by night. He is a self-proclaimed "paper nut", and his work shows just that. Michael is co-owner of DemiGod Studio, an ecclectic duo of craft & art show afficionados. When he's not working on plans to open his very own shop, he bides his time coming up with new and inventive ways to use up the stockpile of paper he has accumulated over the years. 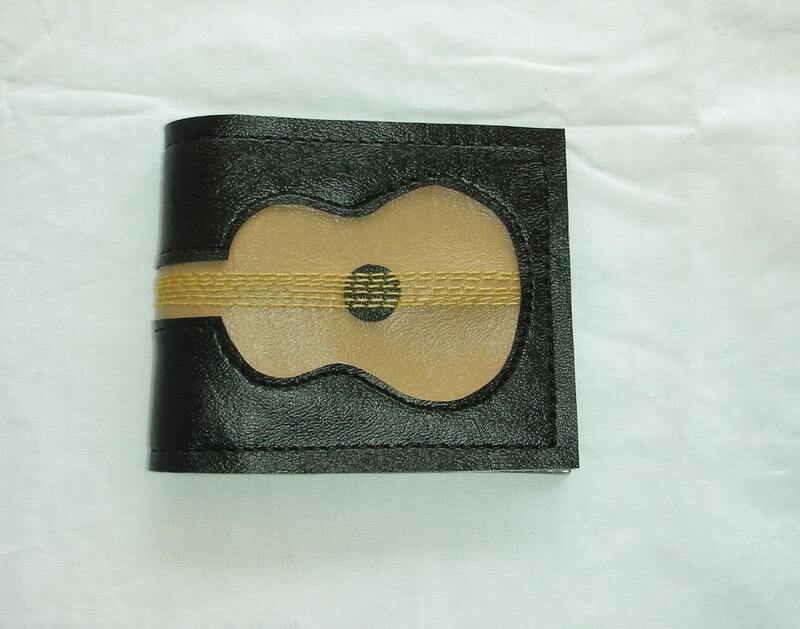 Michael started Darjeeling Paper, Ltd. as a way to showcase his paper goods, and to distinguish his works! You can check out Michael's shop at http://darjeelingpaper.etsy.com/. Visit My Fairy Babies for a custom designed fairy for your little one. These sweet little dolls would look adorable sitting under the tree on Christmas morning, or peeking out from a stocking. This is a picture of Candi - she's just 8 inches tall, and she loves Cotton Candy and Coney Island hot dogs! 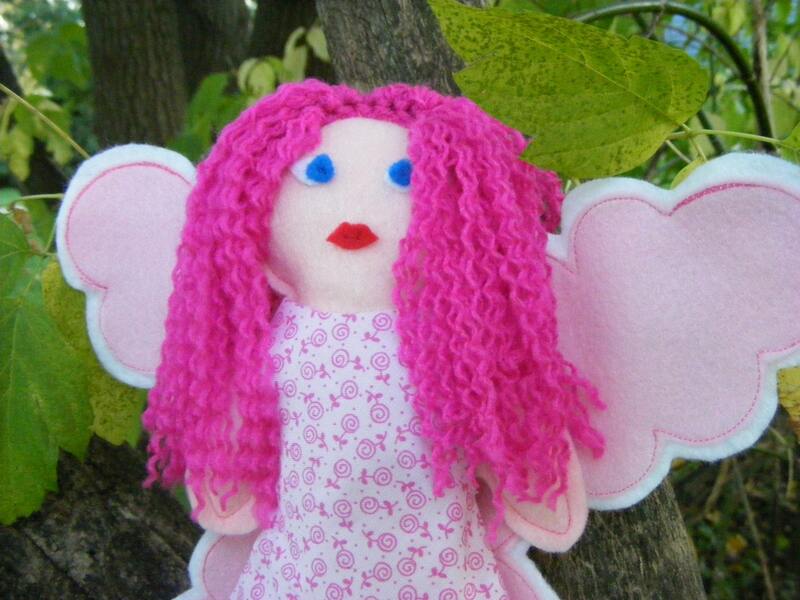 Candi is just one example of the precious fairies you can bring home for your child to love. This Etsy artist puts a lot of love and time into her creations, and states that she would love for them to get a new home where they can be appreciated. Don't see exactly what you want? Customize your child's fairy by picking any combination of color or pattern. Another great feature is that these fairies are safe for children of ALL ages - made with no lead, and offering no choking hazards. 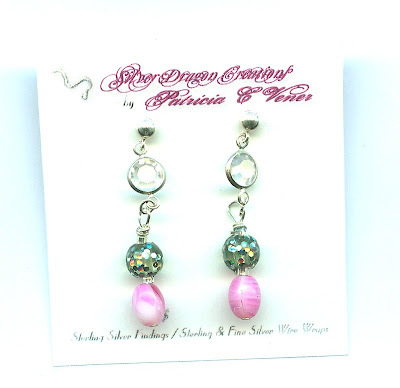 The Sweet Irie Etsy shop has lots of beautiful jewelry to choose from. I particularly like this wire wrapped pearl ring! She's got it right when she says: Pearls ooze elegance and sophistication and make you feel beautiful each time you wear them. 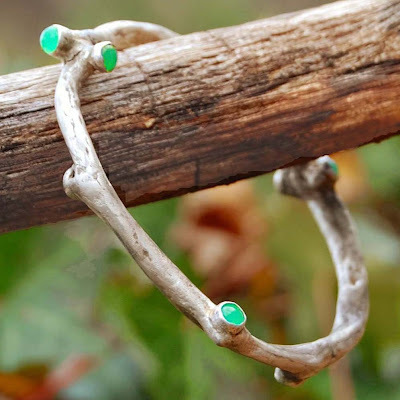 Perfect for any season, this ring is unique! I've said it before, simple jewelry is just my style. I love pieces that look great with anything you wear. Bet you're wondering about the name Sweet Irie right? Irie is this Etsy artist's sweet little cat. Irie likes to participate in the design process as much as possible, which is often just serving as a source of creative inspiration. Take a peek! 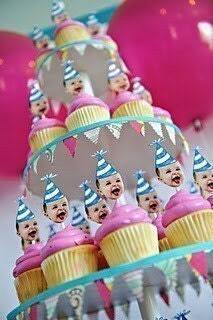 If you have a two year old like I do, you may utter those words an inumberable number of times in a day. Always the answer is the same... THANK YOU! Here's the perfect way to say it... to your customers, to that thoughtful friend, to your always there for you family, to anyone deserving of those two sweet words. 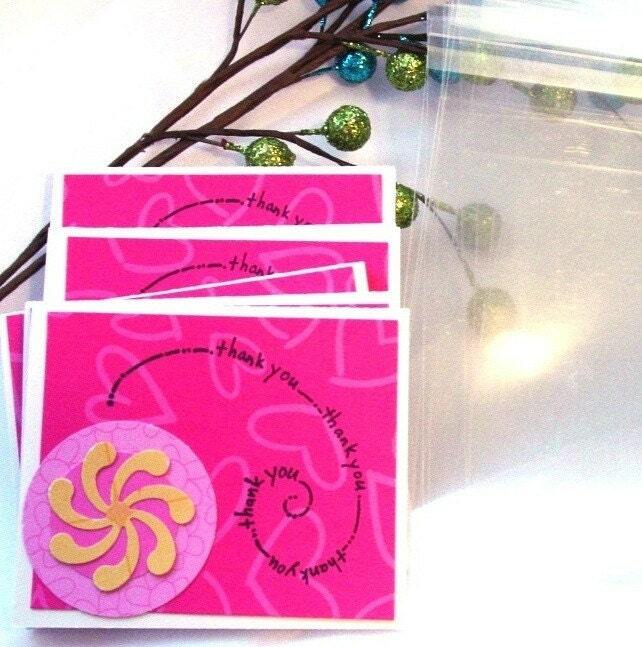 Katie of FromMyHeart2Yours is the creative mind behind these adorable note cards. She admits that she has a not so secret addiction to decorative paper and she obviously uses it for good. 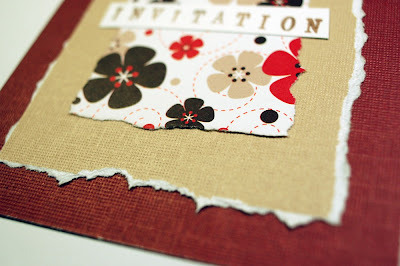 Check out Katie's lovely corner of Etsy to find more creative uses for her favorite medium... paper of course. Her embellished letters would be a great detail in a nursery or childrens room, or even just leaning on a shelf in your office or studio! Mineral Magic takes great pride in her makeup line and guarantees 100% satisfaction. 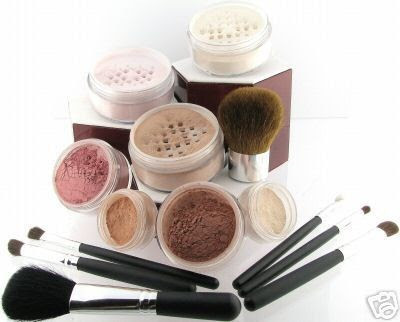 Mineral makeup is pure, crushed minerals from the earth, that improves your skin condition. It provides an SPF (sun protection factor) of up to 20, depending on how much you apply. It is an anti-inflamatory for your skin, as well. Her makeup does NOT contain bismuth oxychloride, which is kin to arsenic, and is most likely the reason for skin discomfort and bad skin reaction. Since these minerals are 100% pure, bacteria cannot be supported and there is no expiration date. There is also virtually no allergy risk. It won't clog your pores and is used as a mineral supplement for your skin. Please visit Mineral Magic at http://MINERALMAGIC.etsy.com. This is an Etsy shop definitly worth exploring. Lost Mitten freatures hand made crafts and geekery. 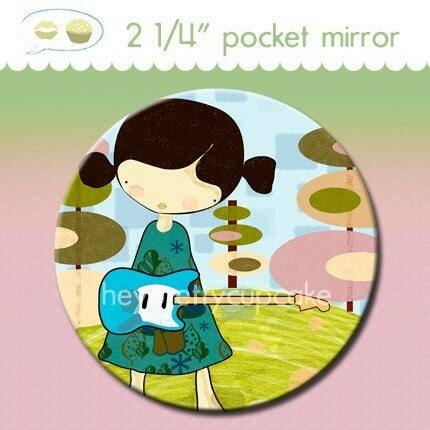 One of my favorites has to be the set of 4 Nancy Drew one inch pinback buttons. How cute! Lauren's unique and orginal stlye is endless. Take the time to check out her site. You will be glad you did. Lauren is 25 years old, and creates all of the crafts for sale in the Lost Mitten Etsy Shop. She is currently living in Brantford, Ontario, Canada with her fiance, Paul. 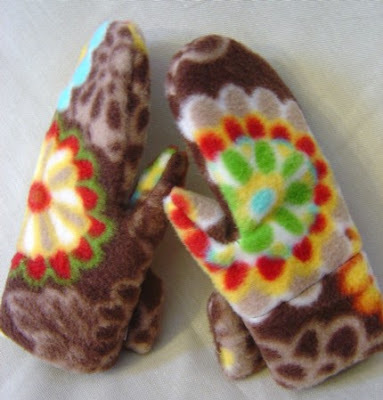 She has been creating handcrafted items for her Etsy shop, Lost Mitten, since September 2006. Lauren and Paul are both huge video game addicts, ranging from the early days of the NES and SNES up to the latest games (especially for the Wii and DS!). 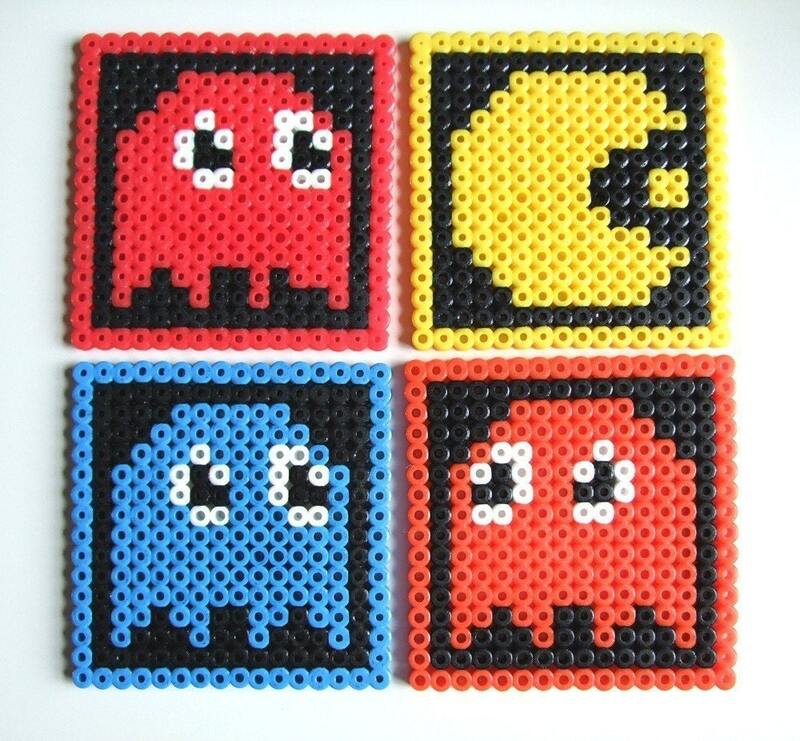 She is continually inspired by her love for video games in creating many of her original crafts. The items in her shop are all highly unique and original - She comes up with all of the ideas on her own and continually tries to be creative by crafting new and interesting items for her shop. http://yaslani.etsy.com/ is one of those shops that you just can't resist looking on every page just to see what unique items you will see. Each piece looks as though it comes from the "passion" in an artist's heart. I'm sure you will find nothing exactly like it, each one would make an inspired gift that shows you truly are thinking of that person specifically. Check it out! Pippit Carlington has been creating art ever since she was 2 years old. At age 5 she wascomposing songs on the piano; teaching herself to play by ear. She often found herself re-designing things she saw around her, in 6th grade she constructed the class mascot; a 4 foot-tall owl sculpted out of paper mache, and in junior high she began selling various art items she had made. Over the years Pippit went on to receive formal art training at Callenwolde Center for the Arts, The Atlanta College of Art, and Atlanta Jeweler's School and Studios. 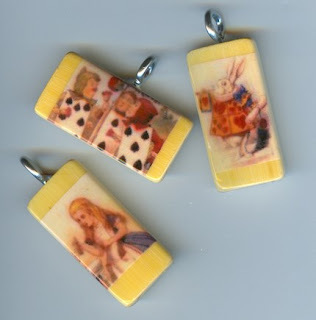 Pippit works in several mediums;including acrylics, watercolor, drawing, clay sculpture, and jewelry. A multicultural influence is evident in her work reflecting a diverse heritage of Iroquois Indian, Hawaiian, Russian Jewish, and French Canadian. She is strongly influenced by nature, political and social issues, and uses her art to educate the public.Two paintings from her September 11th Series appeared at a show on war at The Spruill Center Gallery. One of them titled, "It Makes You Realize What's Really Important", depicts a family comforting each other with an American flag in the background. The other shows the rescue effort at Ground Zero, "Amongst The Chaos". That series also included portraits of Osama Bin Laden and George W. Bush. Pippit says of it "This series was really an exercise in patience and tolerance. It was a difficult subject matter, but I felt it was important to document this event in history so that hopefully people would never let this happen again." The portrait of Osama Bin Laden evoked such an emotional reaction that the gallery exhibiting it in Sautee, GA. had to take it down. The gallery-owner reported that people told her it was incredibly realistic and that was why people were so deeply affected by it on a visceral level.One of the other paintings in the series, "Blessed Event" shows the resilient side of September 11th; the story of a woman who walked several miles after being separated from her car to the local emergency room to give birth to a healthy baby. Journalists had done an interview with the new mother and her husband for Time Magazine.Greeting cards and bookmarks are available of some of these paintings. The Sandy Springs FestivalAnnual GA.
You can visit Pippit's shop at http://giftbearer.etsy.com/. How perfect would this be hanging on your beach house... no beach house?!... how about the gate to your pool... no pool?!... how about your front door? 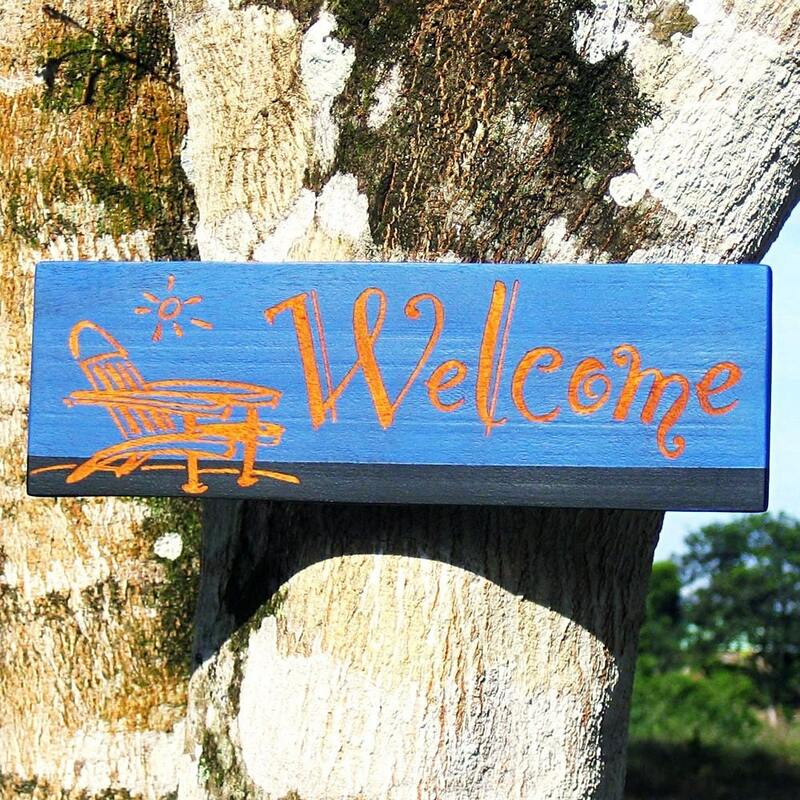 This sign is carved from Belizean hard wood, hand painted, and customizable. So, add your name or location to the bottom and call it your own. This Etsy crafter is a graphic designer and Canadian who now resides in Belize. 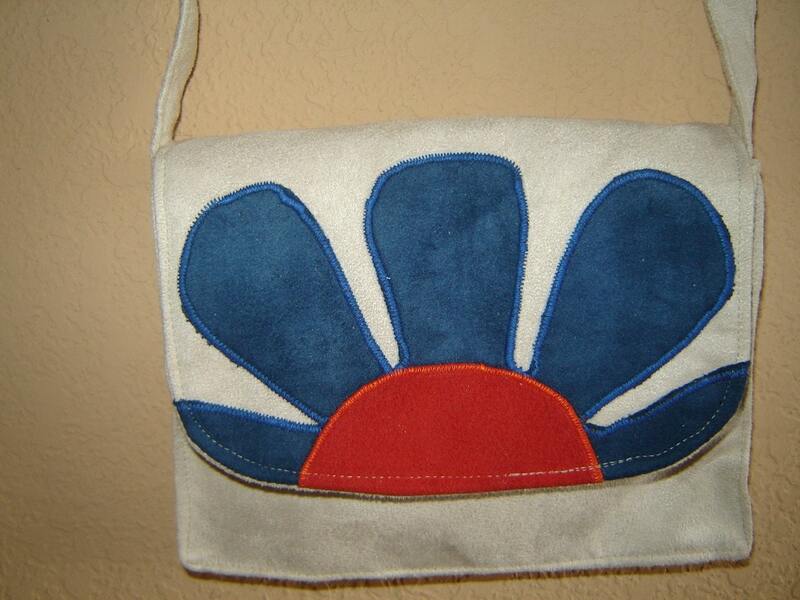 Let her bring a little Belize to you with one of her wonderful pieces of art at http://coconutpalmdesigns.etsy.com/ ! You'll be cooking for Thanksgiving right?! If not, you should definitely be bringing a special gift for the hostess who did all that hard work and I've got the perfect thing! Check out this super cute, super stylish apron by Mommy and Me Boutique. Corline, the creator of this wonderful apron, is a women after my own heart, she loves designer fabrics and beautiful trims and ribbons. You can find this apron as well as aprons for your little one and some gorgeous baby blankets at her little corner of Etsy http://mommyandmeboutique.etsy.com. 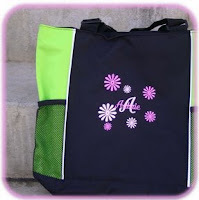 Adrienne N's Etsy shop has some really great personalized items. Check ou t this tote bag. It'd be great as a little gym bag! Adrienne is a Mom to 4 and spends even more time with little ones at her day job as a preschool teacher. She stumbled onto selling her items when she found that she really enjoyed making personalized gifts for her friends and family and decided to see who else may love her ideas. Visit her shop on Etsy and her blog for more of her embroidered items. Creative Sundries http://creativesundries.etsy.com/ is a mother and daughter team. They both share a love for vintage items, and their shop refelcts this a great deal. The piece above is my absolute favorite! 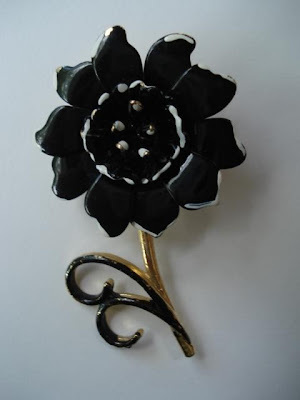 It is a goldtone figural brooch, flower-shaped, with lovely black and white petals. Approximately 2 inches (6 cm.) tall and 1.25 inches (3.5 cm.) wide.The petals are somewhat flexible and can be carefully repositioned. I think this would look adorable on the lapel of a winter coat! Please check out Sarah and Carol's shop for some really rare finds! How did you come up with your shop name? One of my favorite movies is an old animated flick called "The Secret of Nimh". The goofy bird in the movie calls the ruby-thingy a "sparkly" and my sister and I growing up have always called pretty shiny things "sparklies". A few years back when I started my business/website, I combined the fact that beads come on strands and my love for all things sparkly to create "Sparkly Strandz"
What do you shop for most on Etsy? anything that will make me relax. I can't say that I'm inspired by nature or shapes or anything in particular--I'm not really the "artsy" type. To me, it's all about just doing something that I love to do and making something that I think people would like to wear or have. I'm an occupational therapist by trade, and my beads and my crochet is my therapy. What is the first thing you recall crafting? Christmas tree garland by making the world's longest crochet chain b/c that's all I knew how to do when my grandmother taught me. 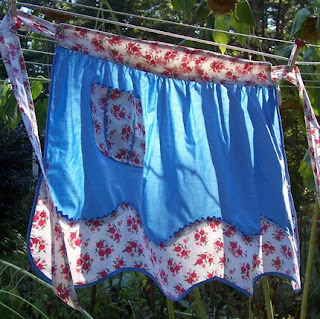 Isn't it interesting how many of us "caught" our love for handmade items from our moms & grandmas. Heritage comes in many forms. If you'd like to visit sparklystrandz.etsy.com I'm sure you won't be disappointed. Eva is a new commer to Etsy showcasing her little creations. I love her creativity and style. I highly recommend you check out her site. She sells jewerly, sewn items, bath items and photography art. Read below to see what she has to say. Definatley looking through crafty magazines, watching crafty shows and browsing through Etsy. Also just thinking about variosu Holidays gets me in the mood to make a cute ornament, bag or decoration.